You are here: Home / Blog / Who Created FSL 11+ Online? This post lets you meet the team behind FSL 11+ Online. It won’t take long, because it’s really just one person. After a decade tutoring kids for the 11 plus in partnership with her very best friend (Kate Bridges, who is still the best 11 plus tutor in Bucks and Herts FYI), Emma Thackray gave it up in order to launch a new online 11 plus platform. What makes you an expert on the 11 plus? I was an 11 plus tutor for the Buckinghamshire exam for almost ten years. That many times round the block taught me everything there is to know in terms of what needs to be studied for the exam, in what quantities, and how to get students achieving their best potential. Of course being a tutor meant I had keep myself constantly informed about the latest 11 plus news and changes in different regions, but by far the most useful aspect of the job came with working with the kids themselves. I’ve been creating 11 plus materials practically since I started teaching, and over those years I’ve learned what kids do and don’t respond to, what gets results, and how to keep attention spans for more than just a couple of minutes! There’s no harsher critic than a child, so if I get feedback saying a student has enjoyed completing a worksheet or watching a video I’ve created, I know I’ve done a good job. Why did you set up FSL 11+ Online? I’ve always had a bit of a gripe about accessibility when it comes to 11 plus tuition. It costs a lot of money and it takes up a lot of time, and those are two things that a lot of families don’t have. Tuition can be really great for children and the right tutor can make the world of difference, but it’s not the right option for everyone. For some families it’s unaffordable, some find it too inflexible around their lifestyle, and some kids just don’t respond well to the kind of pressure that comes with the workload. Every child is different, which means there needs to be more options for ways they can learn, revise and prepare for their exams. In 2018 I decided to stop teaching so that I could focus on setting up FSL 11+ Online. My aim was to create a platform that made 11 plus preparation much simpler, more affordable, more flexible, and much less of a slog! Of course there are already alternatives to full 11+ tuition on the market in the way of books, practice papers and even the odd online programme, but I didn’t think anything existed that was extensive enough, cheap enough, or user friendly enough. It took a lot of patience and roughly three times as much work as I’d expected, but finally I feel FSL 11+ Online is at a place where it delvers on all those things. Some of the courses you’ll see on your FSL 11+ Online profile. What’s included in FSL 11+ Online and how much does it cost? Two full 11 Plus Courses (GL and Durham CEM) consisting of weekly scheduled worksheets, video tutorials, revision and practice tests… all written by yours truly. A big separate bank of online quizzes in all subject areas (English, maths, Verbal Reasoning and Non-Verbal Reasoning), and another bank of extra worksheets in case any extra practice is needed in a given area. Lots of support in terms of schedules, timetables, answers and score guides. This makes it easy to keep track of your child’s progress and identify any areas for improvement. Full practice mock exam papers, including answer sheets, audio instruction guides, score guides, exam technique tips and suggestions for improvement. A full 5-week summer revision course (available from June 2019), carefully timetabled to provide extensive revision and further practice in all 11 Plus subject areas. A monthly subscription costs £14.95 and includes all of the above. Users are free to cancel their subscription at any time (you can do this yourself from inside your profile), which means you’re not locked into paying monthly for any length of time. Why is FSL 11+ Online so cheap? This seems like a bit of an odd question, but it’s one I get asked quite a lot. The whole point of me doing this in the first place was to make 11 plus preparation more accessible; especially to people who wouldn’t be able to afford tuition. There’s an absolute tonne of stuff included for the price and various people have told me I should be charging more, but whacking a big subscription price on it would totally defeat the object. I’ve tried to make sure it’s a price that most people can comfortably afford, and there’s also the option to cancel at any time so customers don’t have to worry about being locked into payment. 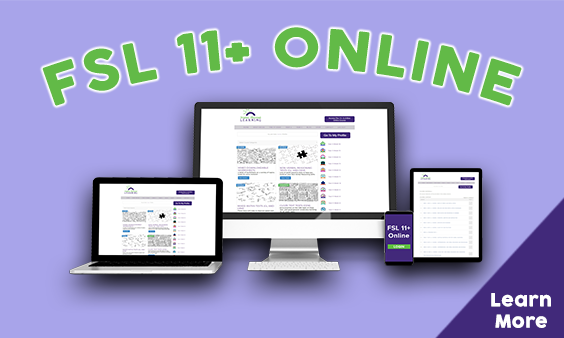 Short of a bit of help with web development, I do everything regarding FSL 11+ Online myself: from creating the materials, to marketing, to general admin. Not having a huge team of people to pay keeps business costs low, which is why I don’t have to charge much for subscriptions. The first few weeks of the course for the GL Assessment 11+ exam. What’s next for FSL 11+ Online? I’ve got so many ideas for ways I can improve and build on FSL Online… I just wish there were more hours in a day. I’d eventually like to extend it so there are more courses for things like SATS and common entrance exams, but for now I’m concentrating on making the 11 Plus stuff the best that it can be. At the moment I’m finishing up two more sets of full mock exams, and I’m also putting together a full 11 plus summer revision course that will make sure students can easily feel prepared for the exam when they first enter Year 6. Those will both be available on the regular subscription from mid-June, so I’d better get back to work! Want to sign up to FSL 11+ Online or just get some more info? You can do so by clicking here. Remember that you won’t be locked into a subscription, which means you can feel free to cancel your membership at any time if you no longer need it.